We then walked into The Bookover Gallery. If you want to see some amazing images head over to his website, https://www.brookovergallery.com/ As I walked around his gallery I was just in awe from the images to the framing. Thanks Ben Osborne and Marta Echazarreta for showing me what to look for in good matting and framing. There are several galleries in Jackson Hole to get some inspiration. And I look forward to walking into them. After some discussion and weather observing, we decide what to go around the Tetons over to Taghee National Forrest and to the Grand Taghee Resort which overlooks the west side of the Tetons. After an hour drive in pouring rain, we made it to the top of Grand Taghee Resort only to see that the rain was still coming down and there was fresh white powder on the ground. Unfortunately the sunset was a wash, no pun intended, but it was a great scout outing. So we hope to be back for a sunset shot. The weekend is upon us and that means that the park will be packed with tourists with their selfie sticks. So I’m not sure what we’re going do so stick around and find out. Sunrise at Jenny Lake I used a 10 stop ND filter to smooth out the water and a circular polarizer to make the water clear. Jason Eldridge of Nature Photography setting up a shot. The sunset that didn’t happen. Somewhere behind those grey skies is The Gran Teton. We’ll be back when there is better light. So, I said a few days ago that I’ll be blogging on a daily basis, well I missed yesterday due to a really long day. 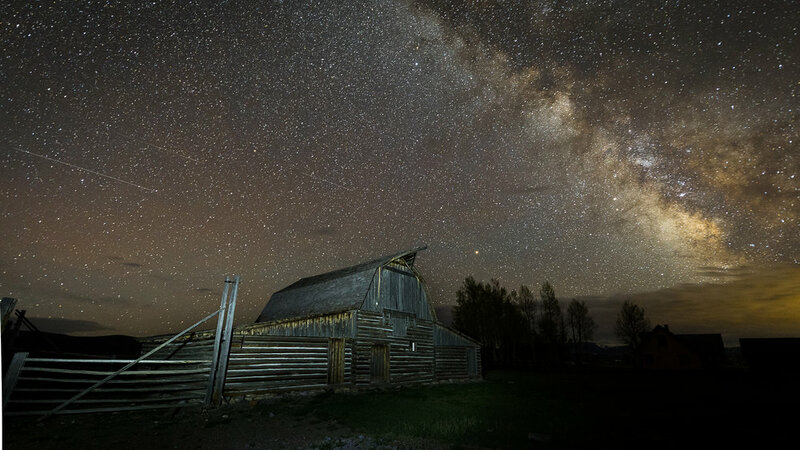 That day started at 2:00 A.M. with an astrophotography shot of one of the Moulton Barns with the Milky Way in the background. What an amazing night sky. I’ve been out and seen stars but that morning the sky was littered with them! After the clouds decided to move in, we took a quick power nap in the car. For sunrise, we headed over to the other Moulton Barn with the Tetons in the background. What an amazing sight to see when the sun came over the horizon an lit the barn and mountains. Once we came back the the apartment, it was time for some much needed sleep. After some food in the tank we headed out to Jackson and Jenny Lake to scout out future sunrise spots. It’s funny how the body works, I could feel something was wrong and I remember what altitude sickness was and thought I should get some rest. So we headed back to the apartment and I was out by 8:00 P.M. This morning we headed out to shoot a sunrise, after a few minutes wondering if we should go to Jenny Lake or go to Snake River Overlook. 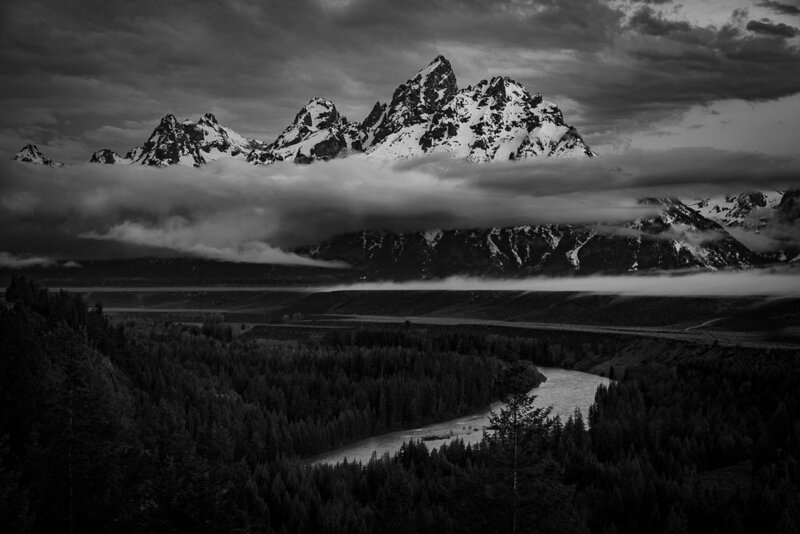 Well with the fog rolling in it was an easy decision to go to Snake River Overlook. WOW!! I got to stand in the same area as Ansel Adams did when he took his famous Snake River photograph. Last year I photographed Yosemite National Park and now I got to photograph Grand Teton, same as Ansel. I would describe the weather this morning as epic. Rain, wind and cold temperatures made these images look like they came right out of something from Lord of the Rings movie. This evening we went out looking for some wildlife, bears in particular. While driving we saw two juvenile moose hanging around. 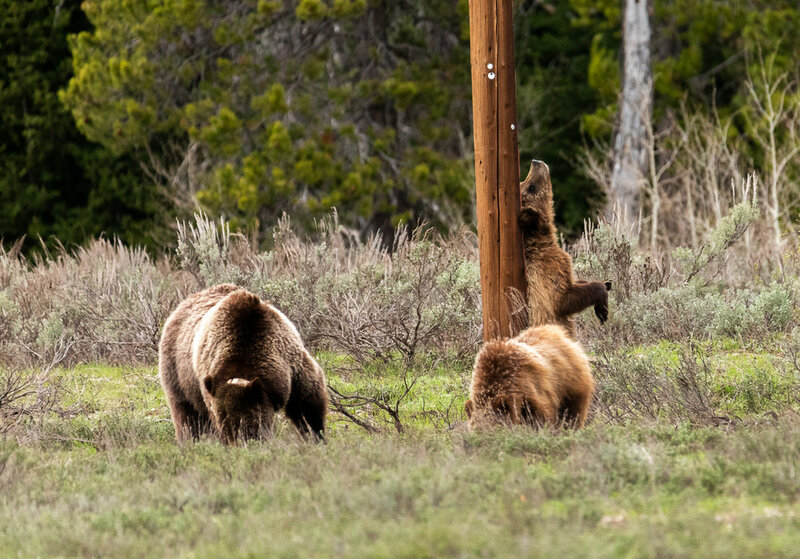 Then we headed out to Pilgrim Creek to see one of the world’s famous bears, Grizzly Bear 399. She’s as famous that she has her own Facebook page, https://www.facebook.com/Grizzly-Bear-399-278005992220778/ While driving we notice a few cars parked along the side of the road and we knew what that meant, a bear jam. She was there with her two cubs looking for food and just being bears. We were glad to have found these bears because we were worried we couldn’t find any in the park. I think from here on out it should be good. 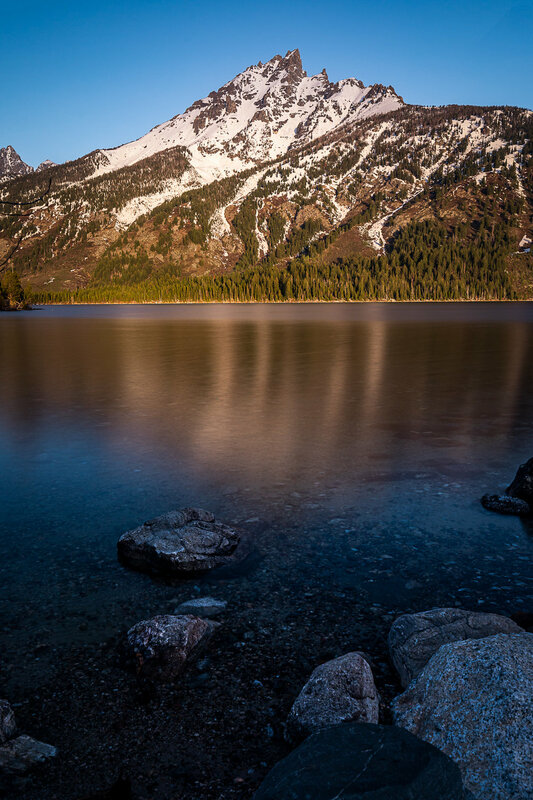 Tomorrow will be another sunrise in either Jackson or Jenny Lake, then a sunset on the other side of the Tetons. Hopefully I can do a quick blog with those images. Until then enjoy these below. Milky Way over Moulton Barn with a few shooting stars. The other Moulton Barn with the Tetons in the background. The famous Grizzly 399 and her two cubs. Looks like one needs his back scratched. Well I finally made it to Wyoming, home of Yellowstone and Grand Teton National Parks. Two amazing parks. I’ll be out here with fellow photographer and host of The Nature Photography Podcast, Jason Eldridge, if you haven’t check him out I highly recommend it. I’ll be out here photographing the amazing landscapes and wildlife around here. This afternoon we went out to an overlook where you see the Tetons with some nice sidelight on it. I’ll post below some shots with my phone. Tomorrow morning is an early rise, 2:00 A.M. Yes, you read that correct, 2:00 A.M. Why? Because we’ll be able to catch the Milky Way rise over the mountains. Then stay up for the sunrise. Well, I’m going to keep it short because I need to get some rest. It’s been a long day of travel, been up since 5:00 A.M. Miami time. In the meantime enjoy these behind the scene shots.